Oh my gosh you guys! We have a pool! I can NOT believe it. Granted it only has about a foot and a half of water right now, but I AM IN AWE. I'm not the kind of person who owns a pool. I'm the kind of person who has to duct-tape her broken shoe together in the middle of her shift. That's who I am. Not this grown-up person who has a pool. I promise I'll get over this soon. Can you believe you use a garden hose to fill a pool? I don't know what I was expecting to use, but it cracks me up every time I walk outside, seeing that tiny hose guzzling away, taking on such a huge job...the little engine that could. Gary (our pool guy) says the pool will be full by tomorrow. Then we can treat it with its cocktail of necessary chemicals, and it will officially be ready for occupants on Saturday. Since our 'pool warming' party is on Saturday, we're cutting it a little close. 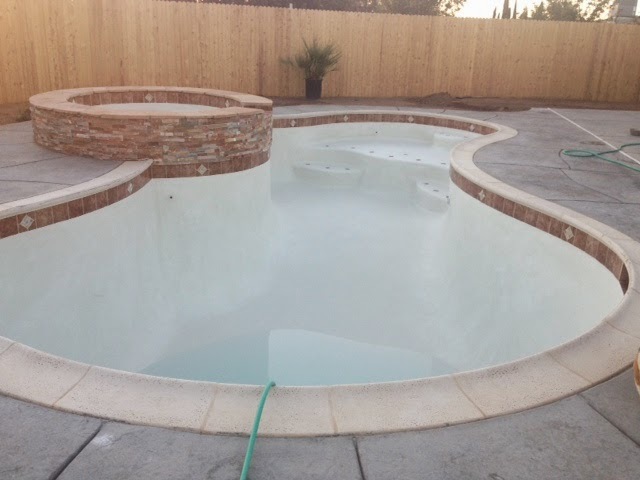 To sum up the whole installing a pool experience, I would say it's sheer bliss for the first two weeks when your contractors are doing all the work, but then it's pretty much hell when you're trying to pass inspection. I swear we barely made it. We failed our inspection on Tuesday, and Gary had to beg the supervisor to come yesterday to reevaluate our fence. We finally passed inspection yesterday, just in time for the crew to plaster today. I have to hand it to Gary. Our pool was originally promised by June 18th, and he delivered it today, on June 19th. One mere day late, despite all of the obstacles that got in the way...including the fact that our plaster crew flaked out on us today and Gary had to hire new ones at the last minute. 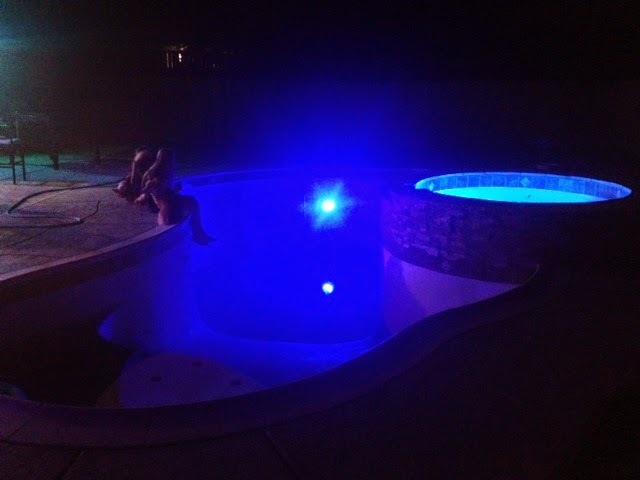 Seriously, it's insane we have a completed pool tonight. We still have some work ahead of us (covered patio and rock-scape), but for now I just want to lay in my backyard and watch that little puddle grow. P.S. I asked Clint what I should title this post, and he said "Rubba Dub Dub This is a Big Damn Tub."